House on Haunted Hill (1959). 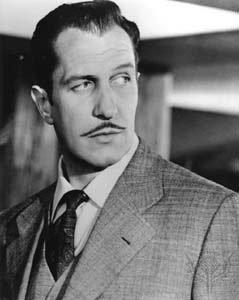 Eccentric millionaire Fredrick Loren (Vincent Price) has invited five carefully selected strangers to a ‘haunted house’ party and promises to pay whoever stays in the house for the whole night $10,000 dollars. With no way of contacting the outside world, the guests are locked in the house at midnight, and as the night progresses, it becomes obvious that this will be a night to remember! Ghosts, ghouls and murder – oh my! William Castle’s lovably daft House on Haunted Hill; a clunky, if not thoroughly enjoyable ghost-train romp through every creaky, hoary old cliché in the book is constructed as the cinematic equivalent of a fairground haunted house complete with pop-up ghosts, disembodied heads, vats full of acid, dangling rickety skeletons and disappearing bodies. 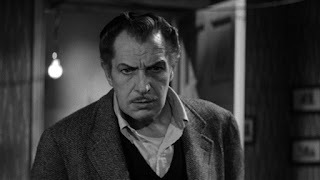 Vincent Price is on top form as the decadently suave and sophisticated Fredrick Loren, throwing himself into the role with the all the melodramatic relish you’d expect; though he actually plays down his customary theatrics in House on Haunted Hill, ensuring Loren remains a dubious character we are never really sure about. Of course we ARE sure about him and by the final reel our instincts are proved right, as sure enough, he is revealed to be a seductively menacing and diabolically scheming individual who plotted the WHOLE thing! And he would’ve got away with it too, were it not for those pesky kids. Surely one of the most beautiful and lushly filmed horror movies, Masque recalls the eerie beauty of work by the likes of Mario Bava and, eventually, Dario Argento. As the sadistic Prince Prospero, Price is diabolically good. His cruel and distinctive tones wax lyrical about the power of the Dark One and the precarious stability of the material world. Philosophical discussions about morality and faith lend the film a distinct gravitas and depth. It is again testament to Price's performance that we actually feel a shred of sympathy for the eeeeviiil Prospero when he realises the magnitude and inescapable nature of Death. The Last Man on Earth (1964). 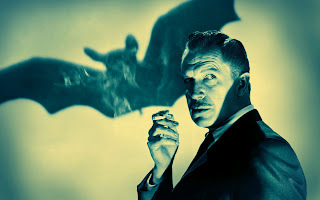 Due to a mysterious immunity he acquired when bitten by a rabid bat, Dr. Robert Morgan (Price) is the sole survivor of a devastating global pandemic. By day he spends his time collecting supplies, strengthening his fortifications and destroying the bodies of the living-dead plague victims. By night he boards himself into his house, as hordes of the vampiric post-human creatures leave their hiding places and congregate outside his house, baying for his blood… How much isolation can one man take? Based on Richard’s Matheson’s chilling novel, 'I Am Legend', The Last Man on Earth is a creepy, deeply upsetting and thought-provoking exploration of one man’s increasingly fragile mental state as he struggles to accept his isolated existence in a dark new world. Price carries the film – he is in every scene – a broken man who has lost his wife and daughter to the plague. He offers a restrained performance, effortlessly exuding the sadness and waning hopefulness of a desperate man with the weight of the world on his shoulders. His doomful intoning contains all the elegant and macabre poise one would expect, and he ensures that the audiences’ sympathies lie firmly with Morgan. Pit and the Pendulum (1961). This was one of the first Price movies I ever watched – sitting up past my bedtime and watching it through my fingers. Watching it now fills me with a blissful nostalgia. But enough of that… The story itself shares little in common with Poe’s tale, save for the titular torture device used in the finale and the overwhelmingly bleak and hopeless mood. Writer Richard Matheson would elaborate Poe’s short story, creating a dark Les Diaboliques type tale involving a melancholy nobleman losing his mind because of the apparent death of his wife (Barbara Steele). It becomes apparent that the deceitful and cruel wife is actually manipulating him from beyond the grave. 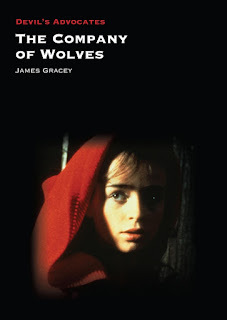 The film teems with memorable and startling images, from the moody opening shots depicting a young man making his way along a harsh and craggy shore to an imposing castle in the background, to the warped and dreamy flashbacks and the images of prematurely entombed bodies. This film belongs to Price. 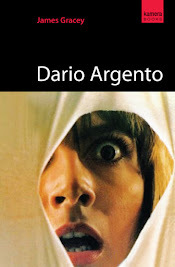 He steals every scene and his depiction of a fragile man descending into madness is immensely touching and chilling. Price’s theatrical histrionics are inimitable and he is one of only a few actors who can do ‘tortured’ so well: yes, he is knowingly theatrical, but he is also mournfully compelling to watch. 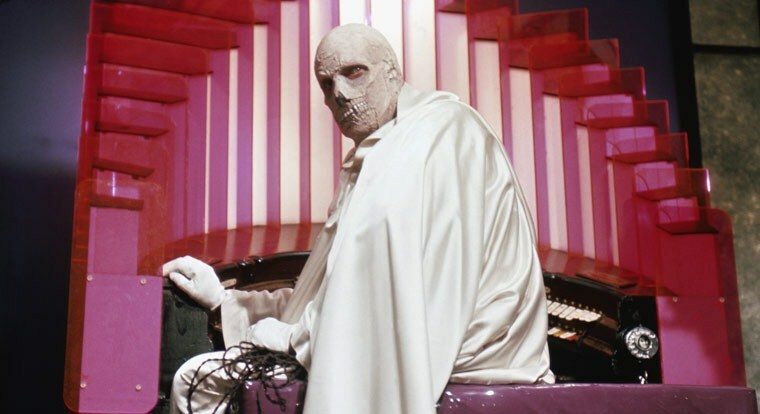 The Abominable Dr Phibes (1971). Renowned surgeon Dr Phibes (Price) fakes his own death and sets about avenging his beautiful wife’s untimely demise at the hands of a group of surgeons, taking the Ten Biblical Plagues of Egypt as his inspiration. This film basks in the glow of its opulent art-deco sets, lavish dialogue, overtly camp performances and fiendishly dark sense of humour. Price’s performance is one of undeniable theatrical chutzpah. The sight of him flailing around while playing his organ and gesturing dramatically must be seen to be believed. However is it testament to the talent of Price that Dr Phibes is a tragic and sympathetic monster imbued with haunting pathos, despite all the obvious camp theatrics. Phibes doesn’t even speak for the first half an hour of the film and Price conveys the character’s fragile emotional state through exquisite body language and those piercing eyes of his. Theatre of Blood (1973). Shakespearian actor Edward Lionheart (Price) has his extreme delusions of grandeur quashed when an influential circle of critics pans him and is publicly humiliated at an award ceremony. He fakes his own suicide in order to return and have his revenge; all the murders he carries out are inspired by demises in various Shakespearian tragedies. While this film lacks the melancholic poetry of Dr Phibes, it does maintain a literary finesse and its humour is just as irreverent, camp and politically incorrect. Price is once again at the top of his game. While thoroughly deranged, his character still retains a modicum of humanity and sympathy. While he veers from hammy to hammier, the actor invests such theatrical vigour and enthusiasm; it’s impossible not to enjoy the blackly humorous story as it unabashedly unfolds. In a number of scenes when we are allowed a glimpse into Lionheart’s troubled psyche, he performs several well-known and evocative soliloquies from various Shakespeare plays. Price really shines in these scenes, delivering an impeccable performance laced with sorrowful pathos and a burning obsession. Shock (1946). After witnessing a brutal murder from her hotel room window, Janet Stewart (Lynn Bari) falls into a state of catatonic shock. When she awakens, she discovers she is being held in a private hospital and treated by the sinister Dr Cross (Price) who she realises is the man she saw commit the heinous murder! Shock is not just a creaky ‘old dark house’ type thriller with a mental hospital and a two dimensional villain. 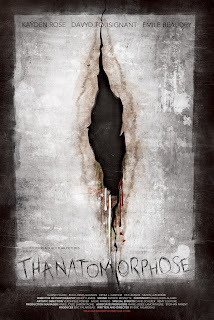 Its twisted and slyly subversive story, in which a perfectly sane woman is made out to be insane so her accusations of murder are not taken seriously, unravels as a tightly constructed and provocative little chiller. Shock is a neat and nasty little thriller that boasts an early role for Price, whose suavely sinister and tortured performance, is the kind he became famous for. The Fall of the House of Usher (1960). When she returns to her family home after their engagement, Madeline Usher is visited by her fiancée Philip Winthorpe, who wants her to return to Boston with him. Her brother, the severely depressed Roderick opposes this suggestion with every inch of his brittle body. Philip discovers that the Usher lineage has been afflicted by an all-consuming malady and that the siblings, the last of the Ushers, believe they are cursed to descend into insanity like their ancestors did before them. A series of morbid incidents unfold over the coming days as events seem set to reach a horrific climax bringing an end to the Usher bloodline, once and for all… Setting the standard for all his other Poe adaptations, Corman weaves a delightfully morose tapestry of gloomy sets, swirling dry ice and matte-painting back-drops that were no doubt used in many of his other shoe-string budget productions. Price is as striking and resplendent as you’d expect. 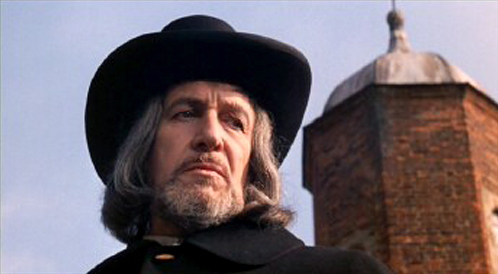 His portrayal of Roderick Usher went some way to map out similar mentally tortured and anguished individuals the actor would portray in his career, particularly for Corman. I’ve had to stop myself here, and I haven’t even mentioned films like The Fly, The Bat, House of Wax, Edward Scissorhands, House of Long Shadows, Cry of the Banshee, The Oblong Box, The Tomb of Ligeia, The Tower of London, The Tingler or Dragonwyck… I think the point I’m trying to make is that Price’s commanding presence is enough to ensure any film is essential viewing. As varied in tone and quality as all the above films are, it is Price and his performances that make them memorable, entertaining, moving and irresistible.